Durham Monthly Meeting of Friends convened in worship for the conduct of business on Sunday, July 15, 2018 with 13 people present. Clerk Susan Rice opened the meeting with a reading from the New England Yearly Meeting website statement, “The Quaker Way.” We did not meet in June. Sukie Rice reported that Eileen Babcock’s will states that a significant bequest will be made to the New England Yearly Meeting pooled invested funds, to benefit our meeting. These funds are unrestricted in their use. 2. Tom Frye is moving to North Carolina to be with family. A group of volunteers (Gene Boyington, Sukie Rice, and Sarah Sprogell) have been cleaning his condominium in Freeport. It will be renovated and sold. It was suggested that the Bernice Douglas fund be used to pay the costs of renovation for up to $20,000; this amount would be reimbursed by Tommie C. Frye at the closing of the sale of his property at 17 Linwood Road, Freeport, Maine. A letter from the clerk (Sukie Rice) regarding this agreement, also signed by the treasurer, Katharine Hildebrandt, will be given to Tom Frye for his signature. Gene Boyington is Tom Frye’s Power of Attorney and is managing Tom’s affairs in his absence. 3. We approved a loan from the Bernice Douglas Fund be used to renovate Tom Frye’s condominium, with an agreement as stated above. 4. Finance Committee: Sarah Sprogell presented the January l-June 30, 2018 finance report of Income and Expenditures Income for this period was $25,851, and expenses were $23,591, Both figures close to 50% of the budgeted amounts. This report is attached. It was noted that the need for Friends Camp Scholarships has exceeded our budget. It was suggested that we ask for donations to meet this need. 5. We approved fund raising for the extra amount needed for Friends Camp Scholarships. An appeal will be included in the Newsletter. 6. Youth Minister/Christian Education Report: Wendy Schlotterbeck reported about several events. “June 2nd was the Annual Yard and Plant sale which earned $750.00. June 3rd was Children’s Day when we celebrated the children and youth of our meeting and marked the close of Sunday School for kids. In addition of many adults present, we were happy to have 10 children/youth among us for the hot dog, mac and cheese and ice cream picnic. A special treat was rainbow fruit kabobs made by Katherine Langelier. We started a quilt of Durham Children’s hand prints and planted a pumpkin patch. We signed cards for 3 graduates in the Durham Family: Elliott Nagler, Andrew Wood and Hannah Wood. The annual family campout at Betsy Muench’s home in Georgetown, June 16-17 was a great success. 25 people enjoyed the sea air, water and beach. We held meeting for worship on the beach under sunny, blue skies, giving thanks for the beautiful world God created, each other and the Muench family’s generosity sharing this treasure with us. 7. Leslie Manning reported for the Trustees. Donna Hutchins has informed the Trustees that she and Daniel Ross will be moving from the parsonage. She will not continue as custodian. The Trustees ask that the Nominating Committee appoint Donna as a member of Trustees. They would like another member as well. Membership in the meeting is required to be a Trustee. They will informally ask people about a new tenant and the position of custodian. They will not advertise at this time. They recommend that the current rental agreement for the parsonage continue. They recommend a rental agreement of $1200 per month to include electric usage; renter would pay for lawn care within the fenced area, plowing, and heat. The meeting would fill the pellet furnace hopper; a new tenant would refill as needed and leave it full. Cemetery: Trustees received an estimate from Andy Higgins for mowing grass using his own equipment, and report that they will pay a salary of $15.00 per hour from the cemetery fund for all locations. Andy will also do the repair work on the columns at Lunt Cemetery. No checkbook has been located for the Cemetery Fund. Donna Hutchins and Margaret Wentworth will go to the credit union and order a new set and void the number series for the lost book. Donna will replace Eileen Babcock on the cemetery checking account which will give us two signers. The second signer is Katherine (Kitsie) Hildebrandt. Donn will serve as the Cemetery Fund bookkeeper and be the record keeper delineating cemetery plots. She will prepare the accounts for auditing. Parsonage: A plumber will be asked to schedule repairs to the toilet and the outside faucet at the parsonage. The gutter on the parsonage porch will be removed. It was recommended that a community wide discussion concerning the future of the parsonage be held, either as an item of business at monthly meeting or at a special called meeting. The clerk will schedule this discussion. Meetinghouse and horse shed: basement windows will season before being painted in the fall. Andy Higgins has agreed to do work on the horse shed, along with the repair and painting of the ceilings in the meetinghouse; he will submit proof of insurance and W-9 form for payment. Andy Higgins made a trash run from the parsonage and storage shed; Wendy Schlotterbeck cleaned the horse shed. Some valued items might be listed on Craigslist or shown to an appraiser for sale. Daniel Henton has installed a system for raising and lowering banners on the south side of the meetinghouse. Many thanks to Dan. Parsonage: investigate a filtration system for water; conduct a radon test; replace storm door and door to patio; monitor pipes in laundry area (insulation, heat lamp, relocation? ); clean attics in garage and house; paint porch floor and ceiling; do electrical inspection. Grounds: Donna Hutchins will check with the Durham Town Office and an appraiser regarding a woodlot plan and tree growth tax reduction. Items listed in the Trustees’ report concerning the meetinghouse and horse shed will be discussed at a later date. Trustees announced a “Love Your Meetinghouse Day” on October 13. 8. We approved the request that Donna Hutchins be added as a Trustee. 9. We approved the following: a new tenant to the parsonage would pay all utilities except the CMP electricity bill, with a rent of $1200 per month. 10. We approved refunding the security deposit to the current renters of the parsonage. 11. 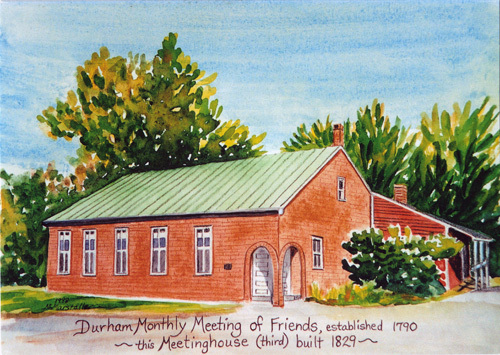 Items listed in the Trustees’ report concerning the meetinghouse and horse shed will be discussed at a later date. 12. Trustees announced a “Love Your Meetinghouse Day” on October 13.
a. Sukie Rice reported that proceeds from the Friends of Kakamega Dinner amounted to $1000, plus a $2000 donation with a total of $3000 for the event! b. We approved scheduling a Seeds of Peace fundraising event, date to be determined. 14. A concern was raised concerning the presence of dogs in the meetinghouse as that might discourage persons of other faiths to feel welcome. 15. Joseph and Alexandrine Godleski have requested that their name be removed from membership as they now live in Florida and attend a local church. We approved, and the clerk will send a letter of appreciation for their active participation in our meeting and that they will be missed. 16. We approved the following persons as representatives to New England Yearly Meeting sessions: Kristna Evans (also representative to NEYM Ministry and Counsel), Sukie Rice, and Sarah Sprogell. 18. The Treasurer, Kitsie Hildebrandt, asked Jo-an Jacobus who initially set up the phone/internet system in the meetinghouse for advice on how to lower our costs. Jo-an researched our account with Consolidated Communications regarding phone and internet service, phone book listing, and repair of the outside line. Jo-an reported that the line will be repaired without cost. She recommends that we move to a two year plan that would cost approx. $80.00 per month (less than the $117 per month if we don’t change the plan). Our phone listing was moved back from the Lewiston phone book to Brunswick phone book. Jo-an recommends that we buy a backup power source due to power outages. Her research is attached. 19. We approved changing our phone/internet service to the two year plan at $80.00 per month and that we purchase a backup power source, not exceeding $80.00. 20. We approved May’s monthly meeting minutes, with corrections noted. The meeting adjourned at 2:15.